This entire series of books has been middling at best, and Winter is no different in that regard than its predecessors. Still, it’s an enjoyable read. The biggest problem with Winter is simply that it’s enormously overlong. At over eight hundred pages, and broken up into nearly a hundred chapters, most of which are very short, it’s a monstrously lengthy read. Unfortunately, there’s just not enough going on in Winter to justify all that length, and while I did enjoy it, my biggest feeling when I finished was resentment at how long it took to finish. The first three books in this series (I’m not counting Fairest, which I haven’t—and don’t intend to—read) were each one better than the one before. Although none of them exhibited any particular excellence, there was definitely a trend towards improvement that unfortunately seems to have plateaued—and that’s only if one is being generous. To be honest, Winter is just a huge disappointment. I loved Cress in her book (after feeling very lukewarm about Scarlet), and I had hoped that Winter would be a similarly interesting character. Sadly, she’s not. For most of the book it felt as if even the author wasn’t sure exactly what to do with Winter, and the princess often languishes in the background, both figuratively and literally. While Marissa Meyer has often utilized fairy tale elements in interesting ways in this series, her choice to include Snow White’s poisoning and the glass coffin was simply a mistake. It had no significant effect on the story, never felt as if Winter was in any real danger, and was just one of the many ways in which Winter was kept sidelined and ineffectual in her own book. The truth about Winter is that, for all its ridiculous length, not much actually happens in its pages. It’s as if all the story was told in the first three books and this one is just eight hundred pages of tying up loose ends. 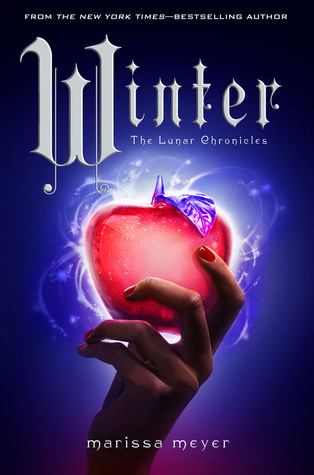 Winter’s personal story never manages to feel like much of a story at all, and while I appreciate that Meyer didn’t end Winter’s tale by having her be cured of her mental illness, I rather felt as if Winter was actually forgotten by the end of the novel, which focused mostly on wrapping up Cinder’s story. I mean, good, I guess, that Winter gets her man in the end, but that’s frankly more irritating than not, since it’s just part of the compulsory romantic pairing off of all the series’ characters. This isn’t to say there’s nothing to like about Winter, but there’s absolutely nothing about this story that deserved such a lengthy treatment. Meyer does a nice job of cramming a happy ending into the last fifty or so pages for everyone, but it’s all really just a little too neat without having any particular dash of cleverness or panache. Even Cinder’s decision to reject being queen in favor of turning the Lunar government into some kind of democracy (it’s rather vague) just feels too on the nose and follows less from the story or character Meyer has created up to this point than it does from sheer convenience. The author wants Cinder to give up being queen and go back to Earth, and so she does. It’s this sort of writing for narrative convenience that makes this series’ ending ultimately unsatisfying. After four books (six if you count a prequel and the upcoming collection of short stories that correspond to each book) and eight hundred pages in this one alone, all filled with things supposedly happening, none of it matters. We get the ending Marissa Meyer wanted to write, but it’s not an ending that feels real or earned or at all worth the journey to get there. The best thing I can say about this series is that it’s an enjoyable read, but it’s got so little substance that I can’t recommend it except as pure guilty pleasure fluff reading. That may have its place, but this final book stretched too long to even be as enjoyable as the previous entries in the series.